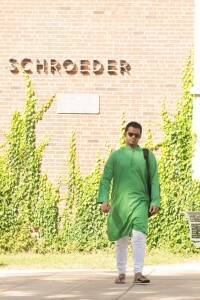 Illinois State graduate student Arafat Kabir. Packing for a two-year, 10,000 mile trip would take a little thought. But Arafat Kabir didn’t pack a thing. First the graduate student from Bangladesh got a bachelor’s degree in engineering and worked for one of the world’s largest petroleum companies, traveling across Southeast Asia. And in Brunei he wrangled an invitation to a party for Queen Elizabeth’s Diamond Jubilee, which was restricted to British citizens. After finding himself engaged with diplomats talking global politics, he figured out what he wanted to do with his life. That direction changed to becoming a writer on global politics and foreign policy, and that’s how he became the student who traveled the farthest this year to attend Illinois State University. Coming from one of the most densely populated nations on earth, with 156 million people crammed into a country the size of Louisiana, he’s finding plenty of room to explore global policy and culture here while applying for internships at places like the Chicago Tribune and the Wall Street Journal (WSJ). Arafat Kabir, from Bangladesh, is the student who traveled the farthest this year to attend Illinois State University. It’s not like he hasn’t been published. Kabir’s articles have appeared in the WSJ and International Policy Digest as he writes about everything from how to rein in Vladimir Putin to Iran’s use of Twitter diplomacy. ISU attracted him because of the size of its Department of Politics and Government, which allows “healthy interaction” with faculty, he said. And he knew Department Chair Ali Riaz was an expert in South Asian politics. Kabir speaks four languages. His mother was an educator and his father, a businessman he describes as politically conscious. When his father was a teen, he spied on Pakistani forces, providing information to the freedom fighters as Bangladesh struggled for its independence. Kabir was ready for the 11-hour time difference here, but there was one thing he wasn’t prepared for. Although his country faces killer cyclones and massive floods, it’s tropical. He’d never experienced wide fluctuations in temperature, but that changed on a day he wore a T-shirt and shorts to class and was caught in a thunderstorm. He’s also adjusting to cultural differences; eating food with your hands is common in his country. Also, people mingle on the streets after work and strangers reach out to one another. “Bengali people are one of the most hospitable people in the world. We become friends very quickly. If someone is in distress, we lend a hand to them and take that stress on our shoulders. Here, it’s an invasion of privacy,” he said. The story is captivating and inspiring but factually incorrect. From Bangladesh to Illinois is roughly 10000 miles. From Kenya where i come from to Illinois is 13,000. He is not therefore the one who traveled farthest to join Illinois! Check your facts right! !